Yesterday while weeding out books for the thrift store, I came across two old books. The first was The Every Day Cook Book and Encyclopedia of Practical Recipes, written in 1892 by Miss E. Neil. It’s a quirky little book because the printer, Regan Printing House, in Chicago, put the cover on upside down. And inside the cover is a sticker for Wrigley’s Mineral Scouring Soap, sold by grocers everywhere at five cents a bar. Why do I keep it? Some day when the mega-earthquake hits, I might need a recipe for cooking cow brains. Yes, there is one for that. Seriously though, Miss E. Neil fancied herself a scientist of ‘cookery’. I love the tone of her voice as she talks about the cooking water for potatoes being poisonous. She gives very thoughtful advice on how the mistress of the house should keep a passbook where she writes down her shopping list and the grocer writes in the prices so she can make sure the maid isn’t cheating her. Think about all the women who used this cookbook, worrying about chyme. 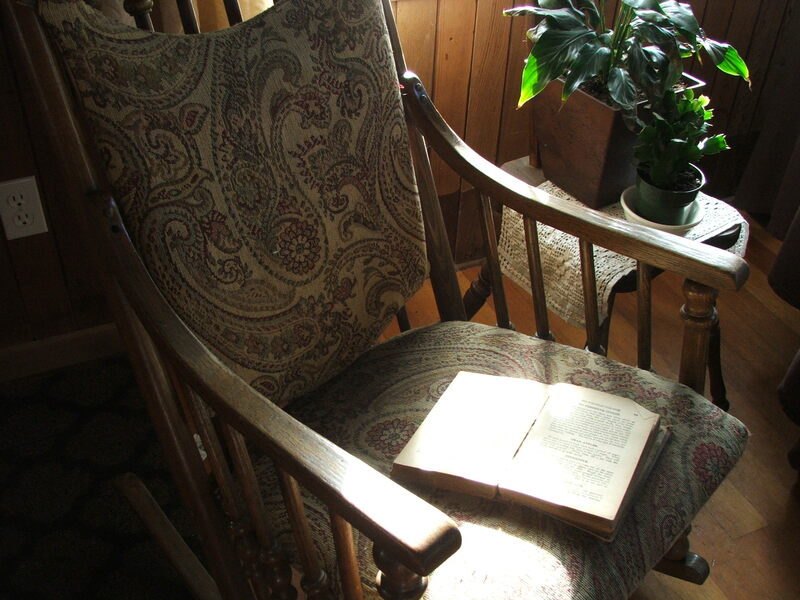 The book is a snapshot through the window of time. The second book is a diary of an old friend of my mother’s, Claire. I’ve posted before about her as she was a very unique woman who made a huge impression on me as a child. I planned to be just like her – a writer and hermit in the woods. 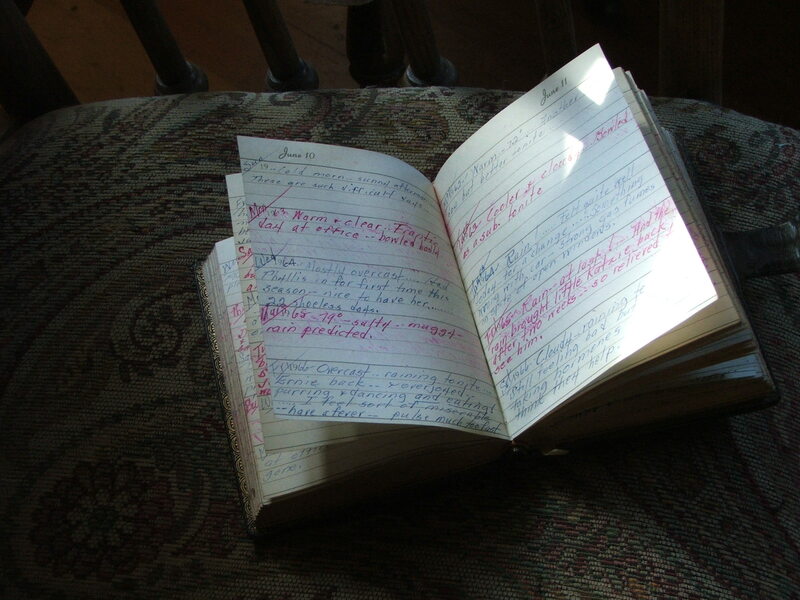 I admit to thinking diaries have to be these esoteric tomes where high lofty thoughts are left for those who follow. Probably why I struggle to write in one. But in reading Claire’s yesterday I realize that, like the cook book, diaries are also snapshots in time. Claire wrote about how many eggs she collected that day. What the weather was. What her weight was, her bowling score. How many days late or early her ‘shoes’ came. I used to wonder why she ordered so many shoes when I only saw her in men’s logging boots. I eventually realized ‘shoes’ were her euphemism for her monthly period. She wrote about her daily thoughts, but in a five-year diary, which meant she had space for only a couple of sentences per day. Some days she simply said ‘A lonely day’. Why does that stand out to me with such gentle sorrow? I didn’t know until I read this that the day my father died was a Saturday of unseasonably hot weather. I think now of my mother sitting at the hospital with three children under age four, on a hot September day, waiting. The details of daily life, jotted in a few sentences, can have such impact years down the road, beyond what the diary writer can probably ever imagine. Love this piece so much Lisa. When I come across my old journal writings I find that I enjoy rereading them so much I’m really regretful I have been so inconsistent with writing them. For awhile when Rowan was a baby I kept a “weather journal” because I wanted an accounting that would span many years of things like dates of first snowfall, first nettle harvest, earliest chantrelles and high waters, not to mention rainfall totals for our soggy neck of the woods. Funny how the journal meandered from weather to so many other topics. I thought of a weather journal years ago but never started one. I wish now I had simply because of how much the weather has changed. But a nature journal would be much more cool to read years later – because knowing you, you didn’t just write down the date of the first nettle harvest and leave it at that. I’m willing to bet there’s a poem or story to go with those entries. It is great to find such treasures, especially in this throwaway world of ours. I’ll have to start checking out the thrift store for books like those you discovered. I’m a great one for ‘purging’ and sending off to the thrift store…except when it comes to books. I’ve been struggling recently to donate those I’ve never re-read and know I never will. And even those are hard to let go of! I know what’s going to happen – I’m going to take boxes of them to the thrift store and come home with boxes of ‘new’ books to replace them.